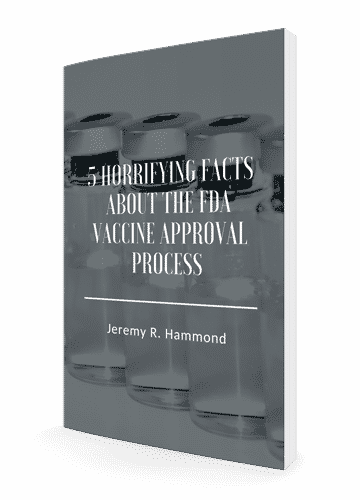 If you are seeking knowledge to be able to make an informed choice about vaccination for yourself or your family, my free report 5 Horrifying Facts About the FDA Vaccine Approval Process will help you on your journey of discovery. Unfortunately, the government and mainstream media not only are failing to properly inform the public about the risks and benefits of vaccines, but are systematically misinforming people. As both an independent journalist and a father, I have spent hundreds of hours researching this critically important subject, including by digging deeply into the medical literature. And from that experience, I can tell you this: what the government and media say science says about vaccines and what science actually tells us are two completely different things. Public vaccine policy represents a serious threat to both our health and our liberty. I encourage you to do your own research into vaccines. My free report will provide you with valuable information, fully referenced so you don’t have to take my word for anything. To end the threat posed by public vaccine policy, we must educate ourselves and gain the knowledge need to speak out confidently and share that knowledge with others. Knowledge is power, and the pen is mightier than the sword. Get this free report, downloadable as a booklet, and join the fight to preserve our right to informed consent. “Glad to see that a rare few independent thinking journalists exist.” — J. P.
“I don’t know how to thank you enough.” — A. R.
“Jeremy, you’re doing great work! Good on you for taking on the media behemoths and trying to get out all the facts about vaccines.” — K. R.
“Thank you so much for taking the time out of your life to pursue the answers to relevant largely unposed questions about our vaccine program, and the science that bears on it.” — J. D.
Sign up and download this FREE report now!